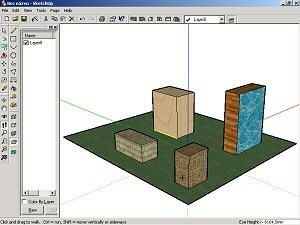 You can use SketchUp software. It's demo can be downloaded from this page . (You can find the link to this program on our download page for members - and we update it there when necessary). Run the downloaded file - and the program installs. The demo offers all the function of full version, but it's use is limited for a few hours. But it's time enough for our work. When you start the SketchUp you can see your scene from the top. You can start painting or switch the view. We recommend to switch it - choose View/Standard views/ISO (from menu). Now you can see the scene (so far empty) in 3D. You can use a lot of tools - just try any. The best one for now will be Rectangle - switch it on by clicking to the button with an image of a rectangle on the left side. Now move your mouse between the red and green axes, press the left mouse button and drag upside. It should start making rectangle. Try to create it as a board on which it will be possible to create more objects later. Now repeat it - on the first board create a few smaller ones as bases for your "buildings". Then try to create a new rectangle by clicking to a corner of an existing rectangle - and then clicking to the second one - and then moving your mouse up. You will get a wall. Similarly you can create a ceiling. If you want to colorize created surfaces, select the Paint tool - by the button with a color can (Paint). You can choose a material and then click to a surface in your picture. You can correct your objects as well. You can choose for example a Move/Copy tool (button with 4 arrows), use the right mouse button to an edge of an object and drag. You can use the Push/Pull tool as well - it will create an object from a surface (for example a cube from a rectangle). And you can use the Erase tool as well (button with a pen with a red arrow). You can rotate and move your picture as you wish. Just use your mouse and 7 butons on the left - these with pictures of magnifying lense, foot, eye etc. And you can select one of standard views as well - in the menu: View/Standard views. When your scene is finished, shift it to the right and save as a left image (File/Export/Raster Image). Then shift it to the left (by Pan tool - it can be switched on by the button with a fist - to say the truth, it moves not the scene but the camera - and it's what we want now). Just try to shift it "a little bit" - and it should be OK. Save the image as the right one. And now use 3DJournal software as usual.